More than one Flower Essence may be suitable for your situation. If so, you can combine up to 7 essences if necessary. This pack contains one 30 mL mixing bottle with 4 labels for multiple use. Please ensure the bottle and pipette are cleaned in boiling water between preparations. Directions: Once the essence or combination of essences has been chosen, add two drops of each chosen essence into the mixing bottle (30ml) containing spring water. Take 4 drops a minimum of 4 times a day until desired results are achieved. 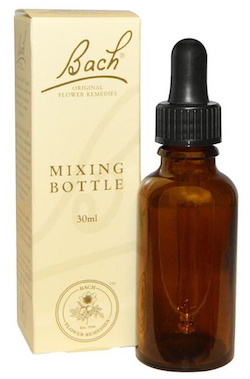 A mixing bottle will usually lst three weeks, at which point it is useful to reconsider your choice of essences to see whether the same ones still apply.